The Council's Corporate Services have already stated, the designation of Asset of Community Value (ACV) can be understood as a breach to the pre-lease agreement that the Council refer to. This pre-lease agreement is precisely what is brought into dispute by the designation of ACV. Councillors should also note that 'disposal' of the building is the issue at hand, and not 'coming to market'. The Council do intend to dispose of the building as defined by Section 88 of the 2011 Localism Act, which defines disposal as an intention to sell or lease the building for a period of 25 years plus. Because they intend to do so, they are obliged to notify the community with provisions for community expression of interest, and a further moratorium period on this decision. 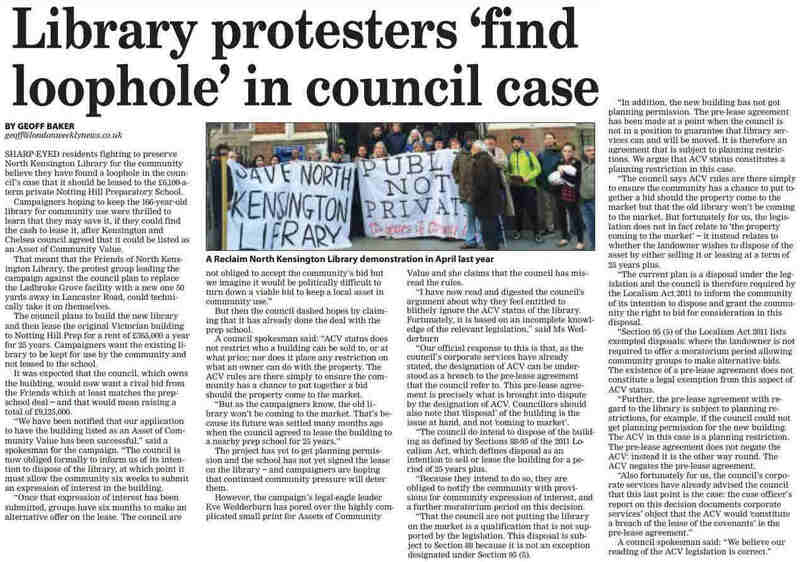 That the Council are not putting the library on the market is a qualification that is not supported by the legislation. This disposal is subject to Section 88 because it is not an exception designated under Section 95 (5). In addition, the new building has not got planning permission. The pre-lease agreement has been made at a point when the Council is not in a position to guarantee that library services can and will be moved. It is therefore an agreement that is subject to planning restrictions. We argue that ACV status constitutes a planning restriction in this case.